Commercial Lending X (“CLX”) provides Out-Sourced Underwriting Solutions that can help most institutions resolve many of the issues their Credit Departments face. Whether it is underwriting new loans, renewing existing loans, or reviewing existing loan relationships, the experienced staff at Commercial Lending X can step in and manage the process for institutions in need. 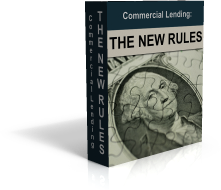 Commercial Loan Credit Departments have always felt strong demands from Bank management and the lending team. There are always plenty of growth goals in place, and in order to meet those growth goals lenders need to process more loan requests. Due to increased management and regulatory scrutiny, a smaller percentage of loans tend to get approved in this market, increasing the workload for Credit Departments to accomplish the same volume on new loan business. In addition, increased regulator scrutiny has created more detailed underwriting and reporting standards, increasing the amount of time each underwriter needs to be spend working each request. Lastly, more detailed on-going monitoring and reporting requirements for existing commercial loan portfolios have impacted the time Credit Departments have available to process new loan requests. Due to the increased demands placed on Credit Departments, most institutions are finding it harder to provide their customers with quick turn-around times and responses, and they are finding it harder and harder to get all of the work done within existing staffing levels. Unfortunately for most institutions, increasing staffing levels in the credit area is viewed as an un-reimbursable expense. Furthermore, finding qualified and hard-working underwriters is becoming harder and harder, and although some Bank’s like to train new underwriters internally, it often means those underwriters don’t have much experience and the quality of work might not measure up and will either require experienced staff spend more time reviewing or the institution risk increases in borrower defaults and regulator action. Quick solution for Banks to meet their underwriting needs – Whether that be to provide quick responses to customers, dealing with an overload of renewals, or trying to get reviews done before an audit. Knowledgeable – We have the expertise existing credit staff might not have with regard to certain types of loans, such as for a special-use property like a hotel, mobile home park, medical practice, etc. Optimal Staffing – Institutions no longer need to hire additional underwriters for short periods of time, reassign existing staff, or hire temporary employees with less experience to complete short-term needs. Institutions can maintain the optimal staffing level they need to manage their portfolios, utilizing CLX to handle all over-flow underwriting they might have. Cost Savings – Use of our Outsourced Underwriters does not require any investment in technology, office space, computers & equipment, or really any other support services from the institution. All costs are incurred by CLX. Experience – CLX underwriters have extensive experience in commercial lending and include experienced credit analysts and credit managers. Each loan is not only underwritten by an experienced credit analyst, but is also reviewed by an experienced credit manager. Flexibility – We can utilize the Bank’s existing preferred presentation form or can provide a detailed form customized to the institution whose loan we are underwriting. Recommendations / Current Underwriting Practices – We will make recommendations and work with institutions to enhance their existing presentation forms to best meet the current best underwriting practices. Follow Institutional Preferences – We will work to learn each institution’s underwriting style and demands, and be sure each presentation conforms with those preferences. Up-Front Pricing – The cost to utilize our underwriting services is typically a flat fee set for each new loan, renewal, new loan with renewal, or annual review, so management knows what the cost is and can easily compare it with their internal cost structure. Furthermore, it gives institutions a defined cost for their underwriting, making it easy to pass on the expense to the Borrower as an underwriting fee should a lender chose to do so. Free Trial – We encourage you to give us a shot. We will underwrite several loans for free to show you what we can bring to the table. Submit a File – The necessary documents can be scanned or faxed to CLX. We will then uploaded all documents via our secure uplink. Necessary documents typically include all relevant financial information (including historical financial information if this is a new request), credit reports, D&B reports, a brief description of the request, any past loan presentations or write-ups for that customer, and any other pertinent documents including copies of appraisals. Initial Underwriting – Upon receipt of a complete financial package our staff will underwrite the loan and put it into either the Bank’s presentation format, or the CLX format based on the institutions preference. CLX will complete all general loan underwriting and the completion of the presentation, including recommendations, credit risk grading, and final conclusions. File Review / Approval by Credit Manager – Once our initial underwriting is complete, the presentation will be reviewed and signed off on by a CLX Credit Manager. Once they approve the presentation it will be forwarded to the institution. Typical turn-around time is 48 hours for all requests, although from time to time questions arise or a complicated loan request may take longer to process. Presentation Review by Submitting Institution – Once the presentation has been approved by a CLX Credit Manager, it will be forwarded to the institution. It will be up to the individual institution to complete a final review and insert appropriate lender comments and background information not provided to CLX. If any errors are found in the review by the institution, the presentation will be returned to CLX and CLX will make corrections immediately. File Security – Once underwriting is complete and the loan request has gone through the full review and approval process, CLX will delete and destroy copies of all financial information printed or saved for that loan request, and that information will be eliminated from the CLX system, giving the institution additional protection and security on financial information provided. Billing – CLX typically bills institutions monthly for the underwriting performed in the previous month, and invoices are typically based on the number or type of files underwritten, and not on hours worked.